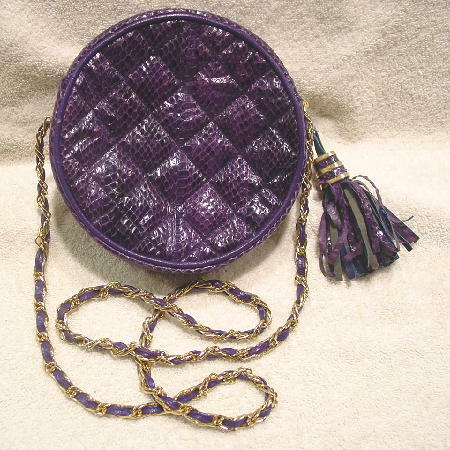 This vintage dark purple genuine snakeskin and genuine leather round evening purse has a black fabric lining with an interior zippered pocket. It has a top side to side zipper closure. There is a 46" long purple leather woven in between a gold-tone multiple link chain shoulder strap. It has a 3 1/2" long tassel. Some of the purple scales have come off the strips which leaves the blue base, which is what happened on the strip which attaches the tassel to the oval link attached to the shoulder strap.